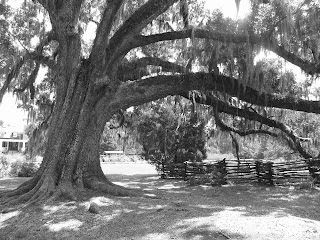 The Magnolia Plantation is located in Charleston, South Carolina and was founded in 1676 by the Drayton family. 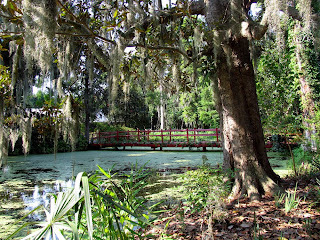 Having survived the American Revolution and the Civil War, it first welcomed visitors to its famous gardens in 1872. It is still owned by the Draytons and I can understand why; this plantation is a slice of southern paradise. The basic entrance fee included all the gardens. For additional dollars, you could tour the house, go on a boat tour, or take a walk through the Audubon swamp. Considering it was over 90 degrees, not including the humidity factor, I opted for the boat and the house tour. 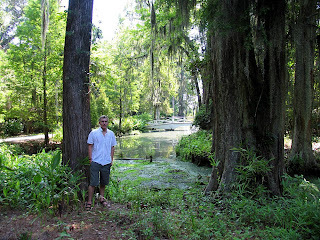 I will be back to take the swamp walk when the weather is a little less, uh, icky. 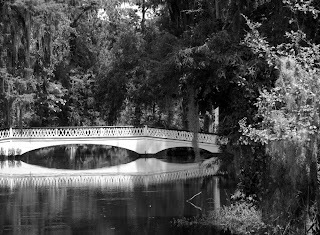 The plantation runs right along the Ashley river. This was obviously used as a system of transportation and the Draytons could travel to the center of Charleston in about three hours. By horse or carriage, it might take an entire day. 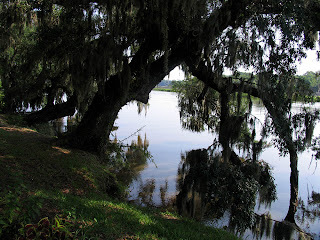 I love the Spanish Moss draped Live Oaks. I'm not sure why they are called Live Oaks, suggesting that there are Dead Oaks which are probably not as grand. 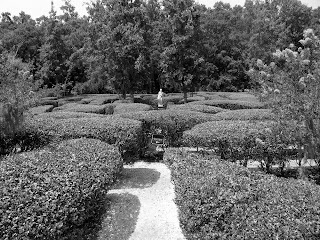 They even had an English maze garden. At the center, there was a statue of a lady. In this searing heat, I almost expected a couple of dead bodies as well but no such luck. I suppose the gardeners become quite adept at clearing deceased tourists away. Here am I in the swamp gardens. You could call me a swamp thing if you want to be nasty about it. Of course, there was lots of wildlife. 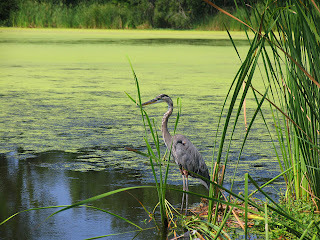 I passed by this Blue Heron in the boat and was able to snap my best picture of this species. I have heard they are a cranky bird and dislike tourists so this photo was pretty lucky on my part. 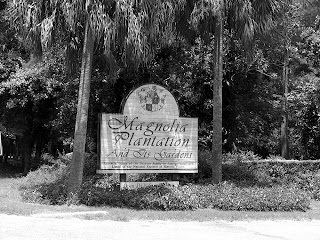 This plantation is definitely worth a visit if you are in the area but try to avoid the summer heat. I have never sweated so much in my freakin' life and little annoying bugs like the taste of suffering humans. Rather, I would opt for spring when the azaleas and the magnolias are showing off their southern colors.